I recently had something terrible happen to me. Well, to be honest, I let something terrible happen to me: I let £50 of Compliments vouchers, which I’d earmarked for spending in John Lewis, expire. Now, I don’t know about you, but gift vouchers to me are like being given free money to spend on things you wouldn’t normally justify spending money on and are pretty much one of the best gifts ever. So you can imagine my disappointment when I discovered they’d expired (especially as I dug them out of the filing cabinet, it turns out, the WEEK after they’d expired; this made it so much worse than discovering it six months down the line). It’s only ok for me to talk about this here as they weren’t a gift from anyone who knows me IRL, but rather part of an incentive for subscribing to Sky TV a while ago. Anyways, as well as being massively pissed off at myself, this event prompted me to have a check through all the gift vouchers and gift cards in the house to make sure we avoid any further such tragedies. And I discovered that a voucher for afternoon tea, given to us by my Dad and his wife at Christmas, was going to run out at the end of June. Delighted with myself for catching this one in time, I promptly phoned up Marco’s New York Italian and got us booked in for today. I was given a choice of two afternoon teas I could book us for- the traditional, English-style one, or the house made New York Italian style one. Both cost £17pp, or £21.95pp with a glass of prosecco. I’d had a sneaky peek at them both on the restaurant’s Instagram and decided to try the more unusual New York Italian tea. I spent the rest of the week looking forward to a Sunday treat. Marco’s has been open for a little over two years now. I gather from the Marco Pierre White group website that he’s put his name to a few hotel restaurants now and I recall him visiting Sheffield around the time of this location opening. How involved he is in running his many restaurants, day-to-day, I don’t know; but I can’t imagine he’s stressing about losing £50 of John Lewis vouchers, he’s done alright out of this restaurant stuff. We arrived and parked up easily on Scotland Street. The Hampton by Hilton, which Marco’s New York Italian is located under, is on West Bar, in a part of the city surrounded by lots of offices. I’d guess it wouldn’t be so easy to find parking if you’re visiting during the week, so probably worth allowing extra time. But for us, on a Sunday, this part of town was pretty quiet, which suited us fine. The restaurant has its own entrance from the street, so you don’t feel like you’re dining at a hotel when you walk in. It hadn’t gotten too busy yet when we arrived, but by the time we left there were two big groups there. We were shown to our table and ordered some drinks and then it wasn’t long before our afternoon tea arrived. 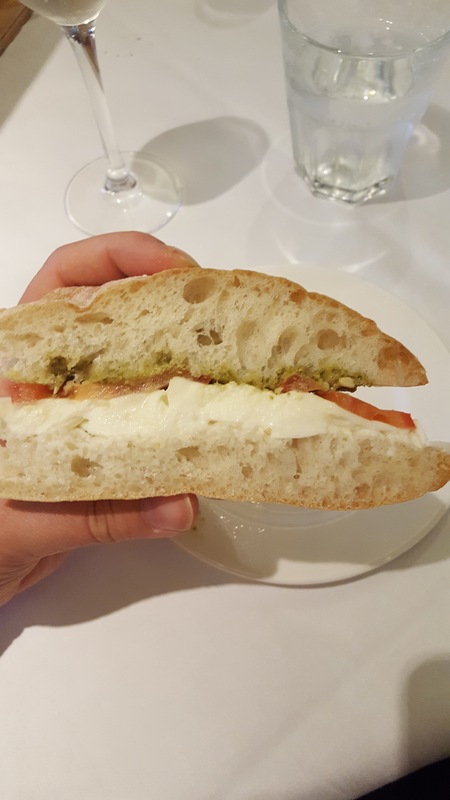 The inside of the bread was so soft and fluffy- but with a good, robust crust- and the pesto was packed with flavour. The sandwiches were obviously freshly-made, too, as the tomatoes hadn’t yet had a chance to make anything soggy (phew). 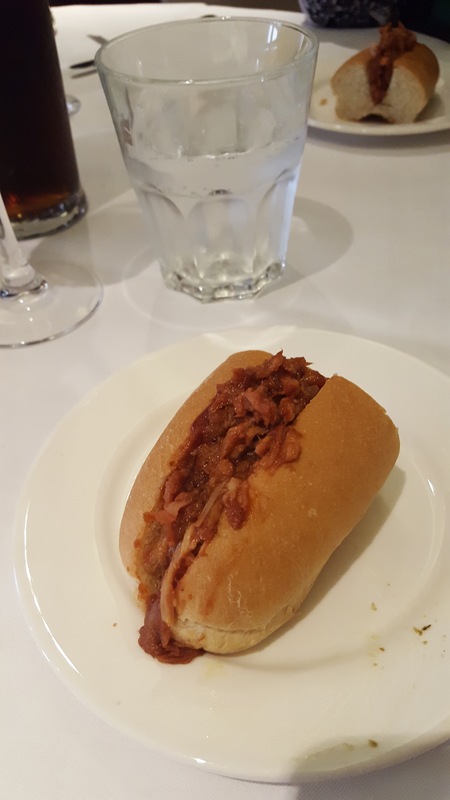 The pulled pork roll was good but I’d have preferred the filling to be warm. That aside, the sauce was tasty and well-seasoned and I can imagine the pulled pork nachos from the main menu are a real hit. Lemon macaron, chocolate brownie, doughnut ball (l-r). Dunkin' donuts at @marcossheffield. More on the blog soon. Both the cookie and the polenta cake were a little lacklustre for me if I’m honest, but they were lifted by their neighbours on the cake stand. Despite being stuffed, I managed to drink the chocolate milkshake shot to finish, which was adorable in a mini milk bottle with straw. My only irritations about the afternoon tea experience were that, as we’d pre-ordered having viewed the menu online, we weren’t given a menu on the day, reminding us of what was what; this also meant that we didn’t notice until we were on the way home that we were missing the bruschetta that the menu promised. Of course, there was plenty of food anyways and this tea was paid for by a gift voucher, but this type of thing does bother me (though the lemon macaron wasn’t on the menu, so swings and roundabouts). And the waiter who brought our afternoon tea over just described the lower layer as “sweets”; one of the things I love about having afternoon tea is listening to the (sometimes OTT) descriptions of each item on the cake stand as they’re served. The only other thing I’d have changed was not having a separate plate for cakes. I’d been a bit liberal with adding black pepper to my smoked salmon bagel, which meant some of my cakes picked up a bit of a kick. While Jameson’s is my absolute favourite for a traditional English afternoon tea in Sheffield, I liked the NY/Italian spin on it at Marco’s and it was a welcome break from finger sandwiches and scones. The service was nice and not intrusive, and the food was of a good standard. The music was good- acoustic covers of pop songs, including Taylor Swift, Robbie Williams and, amusingly, Cher’s Believe at one point. 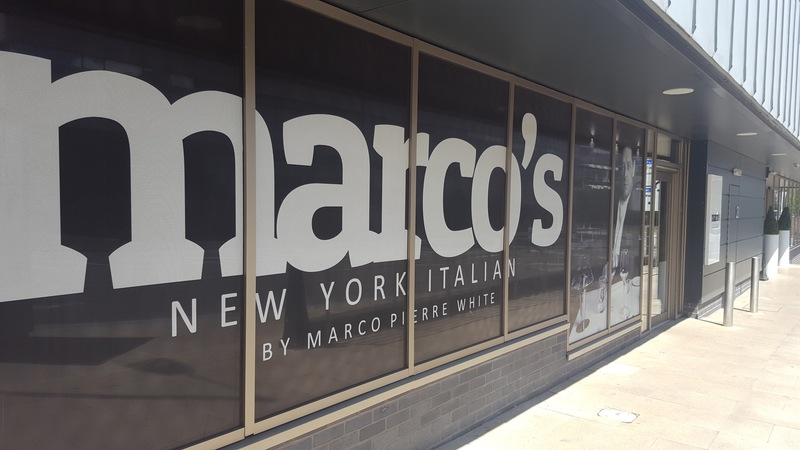 Aside from seeing the man shout at encourage amateur chefs on the telly, I’ve not had any other Marco Pierre White experiences, so can’t compare this to any other restaurants bearing his name. Will I be rushing back? 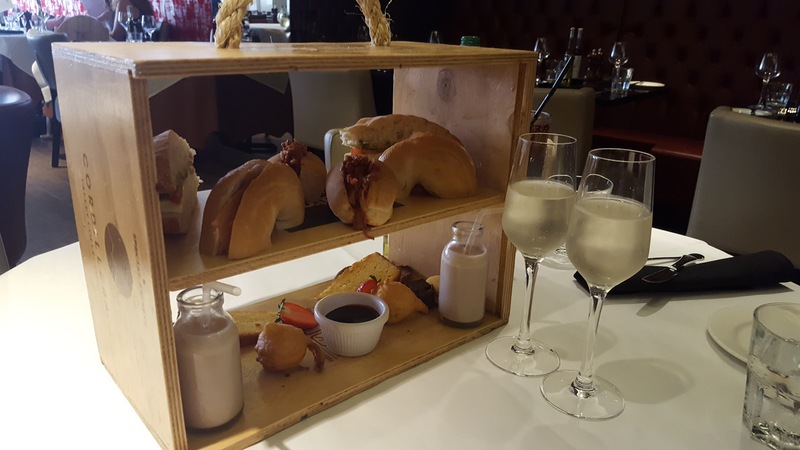 Not sure, but I’m glad to have tried what must be one of Sheffield’s quirkier afternoon teas and checked out our city’s hint-of-celebrity-chef restaurant. And relieved to have not let another gift voucher expire on my watch.